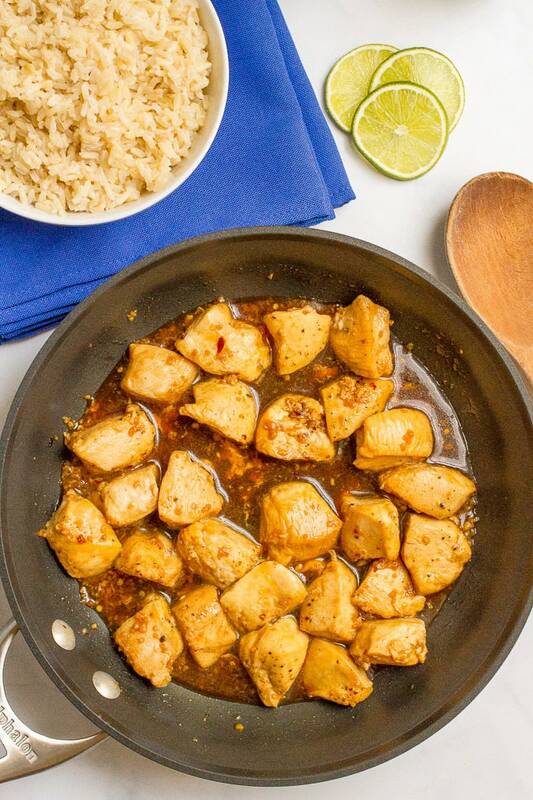 A 5-ingredient, 15-minute honey garlic chicken with an addictively delicious sauce – a perfect quick + easy weeknight dinner recipe! We’ve also got fall activities ramping up and both my husband and I have busy work schedules this time of year. 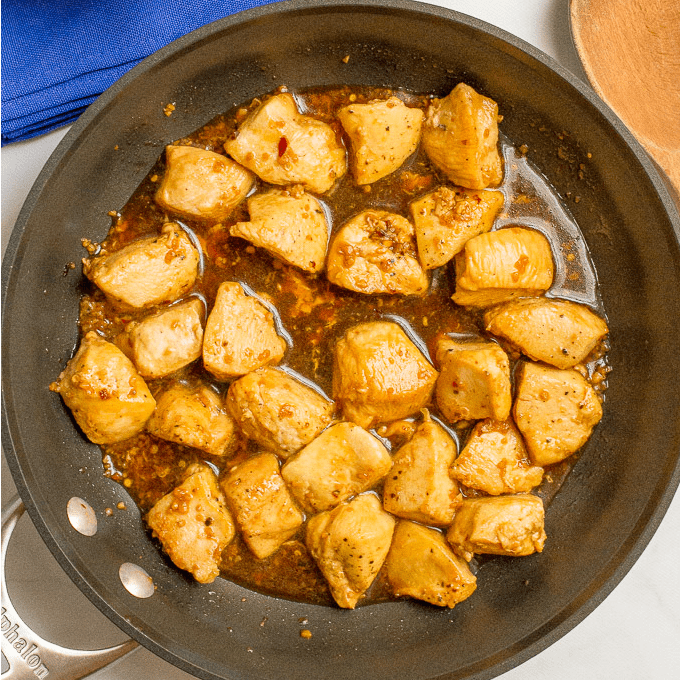 This honey garlic chicken recipe fits the bill – just 5 ingredients and 15 minutes are all you need to whip up this dinner. And just wait until you taste the sauce. Oh that sauce! I literally eat it from the pan with the spoon. I also drizzle it over everything on my plate – the chicken, the rice, the veggies… All of it gets coated in this delectable sauce. It’s got sticky sweet honey, the salty rich soy sauce, a kick of garlic and a hint of spice from the red pepper flakes. It gets glazed on to the chicken and simmered down and concentrated slightly so it’s ready to drip and drizzle all over your plate. Please, put it ALL over your plate! Be careful not to overcook the chicken. The pieces are small so they cook fast, which is kinda the point with this dinner. But you don’t want them to go too far and be overdone. On the other hand, that sauce is seriously so good, it’ll disguise your chicken if it gets a little overdone. It’s nice to have a forgiving dish! 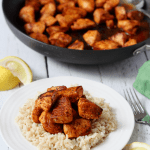 You could substitute boneless, skinless chicken thighs in place of the chicken breasts if you prefer, but the cooking time will be longer. I use brown rice, which takes a little longer, so I get that started first then I prep my chicken and get it cooking. While the chicken is going, I get a veggie ready to steam (broccoli, green beans or snow peas usually – you could also use a steam-in-the-bag veggie) and dinner is ready and on the table in no time! Hope you have a great week! Enjoy! P.S. Check out the VIDEO for this recipe! Add the chicken to the skillet and brown on one side, about 3-4 minutes. Meanwhile, make the glaze. Whisk the honey, soy sauce, garlic and red pepper flakes, if using, in a small bowl until well combined. Add the sauce to the pan and toss to coat the chicken pieces. Cook until chicken is cooked through, 4-5 more minutes. 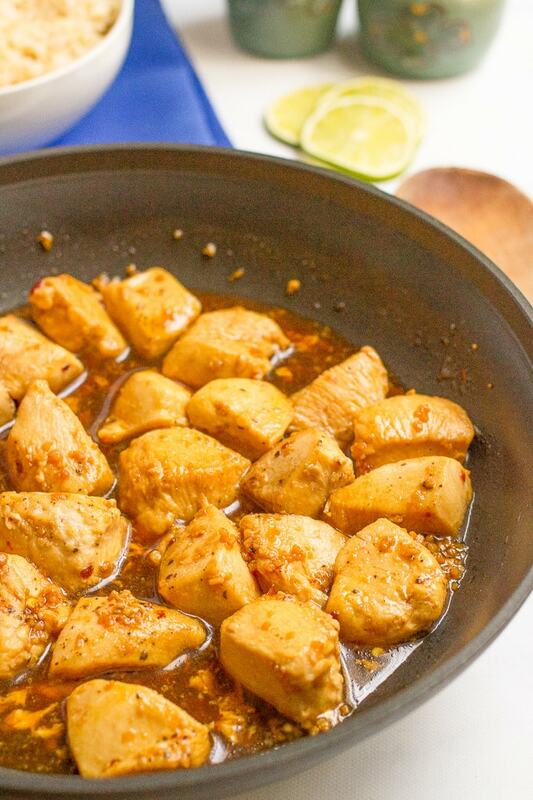 Serve with steamed rice and top with green onions, sesame seeds and a squeeze of lime juice, if desired. Be careful not to overcook the chicken. The pieces are small so they cook fast, which is kinda the point with this dinner. But you don’t want them to go too far and be overdone. On the other hand, that sauce is seriously so good, it’ll disguise your chicken if it gets a little overdone. To make a complete meal, just add some steamed rice and a veggie. Only 15 minutes to prepare this delicious dinner!? YES PLEASE! Pinning! Thanks so much Rachel! It’s a great recipe for a busy day! what if theres no honey? what will i use? 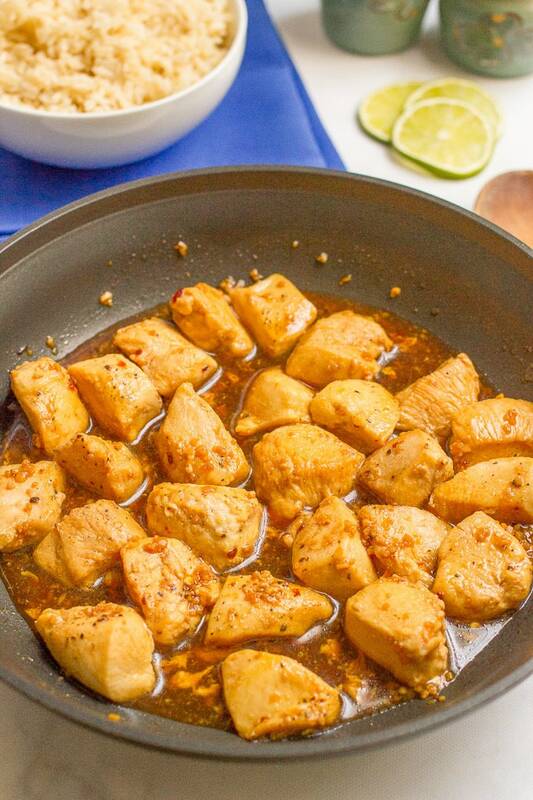 Sure, you could marinate the chicken in advance if you want. That will of course add to the recipe time, but if you’ve got the time, go for it! So after the chicken has been marinated, (and for how long?) Is it safe to cook the marinade sauce with the chicken, or should I discard the marinade and make fresh sauce? Hi Jill – I don’t marinate the chicken when I make this recipe. If you do, I would suggest discarding the marinade before you cook it. Hope that helps! Me too Rebecca 😉 Hope you give it a try! 15 minutes? Woo hoo! That’s some recipe magic right there! Love it! Meals like this are perfect for busy weeknights….just what hubby and I look for 🙂 Love meals like this that are so tasty that you just can’t resist eating straight from the pan….you know it’s good when you do that, right? Pinned, of course! I love any kind of dinner that involves honey and garlic! I can just imagine how good this sauce tastes, Kathryn, and I KNOW I will be drizzling this ALL over the plate! Love that this chicken only takes 15 minutes too! Quick, but delicious week night dinner winning!! Cheers, friend! Drizzle, drizzle, drizzle away! 😉 Have a great week Cheyanne! Ahh! Honey garlic chicken is the best! <3 This looks amazing! Love that it's so simple + quick to make too! Completely agree – I’m addicted! This is JUST the kind of recipe I’ve been looking for to add to my regular rotation! We eat a lot of chicken but have fallen into a bit of a rut – this looks like what we need to help break us out of it. And it only takes 15 minutes?! I am sold. I hear ya – we eat a ton of chicken and I’m always looking to mix it up. This is a great easy go-to for busy weeknights! I absolutely love quick and easy dinners like this. and so much flavor too! Yes! So helpful for getting weeknight dinners on the table! I added broccoli to the dish I cooked it and strained it first. It was delicious everyone loved it and the broccoli really was good. I’m so happy to hear you loved it Sandra – thanks so much for letting me know! Great idea, too, on adding the broccoli! Just made this for dinner and my picky eaters loved it!!! It has become a new week night dinner for us. Fast, simple and quick! New family favorite!! I added broccoli just because we love broccoli. I’m so happy to hear that Lizbeth! Broccoli is one of my favorites and a perfect addition to this – gonna do that myself next time! That makes me so happy to hear Jade! Glad it was a hit and thanks so much for sharing! This was so simple to make and fast!! My very picky family loved it so much! Made a double serving of the sauce and added some rice water to drizzle over the rice. My kids were disappointed when we ran out! New family favorite! Thank you! I’ve made this three times now. I’m obsessed.love this recipe. I’m so happy to hear you love it Janis! Thanks so much for taking the time to let me know! 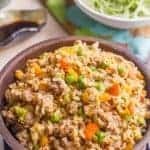 I stumbled on this recipe today by sheer coincidence while looking for a chicken dish today and needless to say my hubby and son went absolutely nuts over it!! Thank you so much for a simple and delicious idea for dinner!! I love how you include nutrition facts!! Not only does this food look amazing but its already got calories listed so less time adding them up!! Thank you!! Hi Robyn! I’m so glad that’s helpful for you! I just started paying for a nutrition info service a couple of months ago and I’m so happy to hear it’s useful for you! Have a great rest of the week! Dinner was Woohoo good. Thank you for this easy yet delish dinner. Such a quick and scrummy dinner. I am making again tonight. 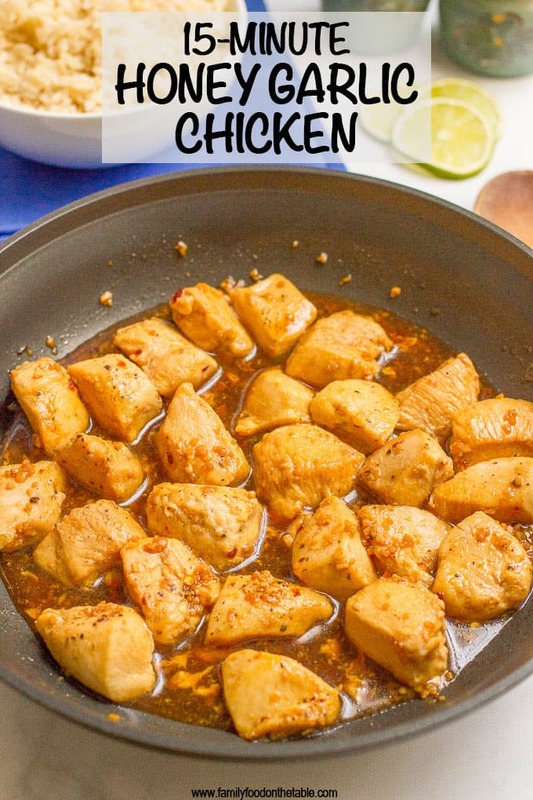 I just wanted to ask, do you think you could do this with salmon/other fish and would I just cook the fish in the pan like the chicken, although I would want it to burn, or cook in the oven first and add at the end? Hi Beth, I’m so happy to hear you love this chicken! Yes, you could substitute shrimp or fish for the chicken here. You could cook fish filets or cube them up (like I did with the chicken). Cook the fish on one side, then flip it over and add the glaze and let the fish finish cooking to your desired doneness as the glaze reduces down for a few minutes. Hope that helps! Wow, that was delicious! I served it over arborio rice, to which I added peas, shredded carrot and red onion. Topped it with toasted sesame seeds, fresh lime, and sweet chile sauce. Loved it! Thank you for the suggestion. The flavors are nice together , but the sauce is scarce and the chicken barely retains the flavor of the sauce- maybe since it’s added so late. Perhaps I’d try the “sauce” as a marinade first, then make a similar sauce that would be a little thicker and more of it. I used 3 chicken breasts cut up and used more than one recipe of your sauce, probably 1.3x but it didn’t add much “sauce” for flavor in those few minutes of cooking. I used wonderful, fresh ingredients and organic chicken. Children enjoyed it well enough, but adults were left a bit lacking flavor. This was really quick, really easy, and very tasty! 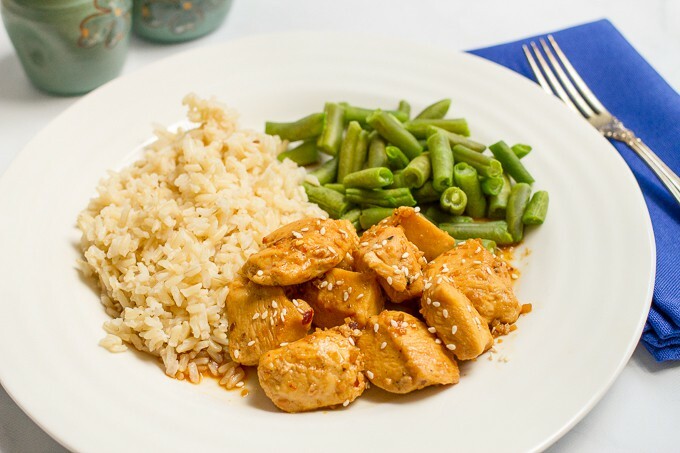 Great for a quick and healthy weeknight meal. Thank you! This recipe was awesome! I threw in some uncooked frozen broccoli with the chicken and then covered the skillet after putting the glaze in. It turned out perfect! Thanks am trying it tonight and really looking forward to it .The soy sauce is gluten free so maybe has slight less salt in it . 🙂 thanks for your reply ! Hi Liliana! The only substitute I know for soy sauce is Bragg’s Amino, which is a pretty speciality product. Otherwise, there’s not much that works well in its place. 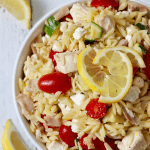 I hope you try this recipe once you’re able to pick some up! Thank you for your wonderful tips Kathryn.It will definitely useful for me and my family. This was super easy and absolutely delicious! It will be a repeat in my house for sure. The only change I made was using roasted garlic. So so tasty. Thanks! Made this last night. Super simple and fast. Finished in lest than 30 minutes. 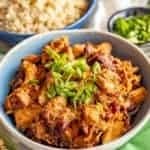 Is it ok to use chicken thighs instead of breast? Hi Rachel! Yes, you can substitute chicken thighs here. Just keep in mind that they take longer to cook so you’ll want to keep an eye on them and perhaps use a meat thermometer to make sure they get cooked through. Hope you enjoy! Perfect for a college student on a budget! Thank you! You are so welcome Bailey! I’m all about simple and affordable recipes! 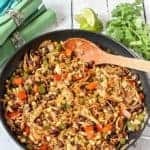 I was scrolling through trying to find a recipe that was quick, simple and delicious. You nailed it, Kathryn. After reading the reviews and substitutions. This is going to be a no brainer for me. I’m excited to try this recipe tonight. Looks like this will be on a weekly menu for a single gentleman like me. Budget friendly and perfect combination of ingredients . It’s definitely a great go-to – I hope you enjoy it Carlo! Thank you, thank you, thank you for this recipe. I don’t often leave comments on blogs, but this was GREAT! When I came across this recipe this morning I almost didn’t try it because all my chicken is frozen, and I didn’t have any pepper flakes, but then I thought I have a pork loin just waiting for inspiration to turn it into something great. Am I ever glad I tried this. So I used pork for the meat, and instead of pepper flakes I used a teaspoon of sambal oelek. I served it with broccoli and brown rice. I was really surprised how fast the whole meal cooked. Everyone always says “it’s on the table in minutes” but his really was just 20 min. Next week I’m going to have a prep day and have all the sauce ingredients measured out in a half pint jar, a big batch of rice done and the meat (thawed!) and cut up so it will take even less time to cook the day of. Made this for dinner tonight and my family of 5 gave it a big thumbs up! Since I have 3 growing teens I doubled the recipe. I also made extra sauce and put just a dash of cornstarch to thicken. Definitely going in my regular rotation. Can you use garlic salt instead?? Hi Amon, I wouldn’t recommend garlic salt. That would add a lot more sodium and make the dish too salty. I really want to try this recipe right now for supper, I don’t have any money though, is there anything that I could use for a substitute? Haha 😊 I think the best substitute here would be agave syrup, but I haven’t tried it and I’m not sure it would be the same. I use maple syrup and honey interchangeably a lot in baking, but I just don’t think that would work well for this dish. Would love to hear if you try it! Thank you, thank you Kathryn!!! This was ready in a jiffy, all 5 of my kids loved it (11, 8, 5, 3, and 16 months!). PLUS, it’s gluten free for my husband!! New favorite at our house! Cooked this tonight. The wife licked her plate. I just made this and can I say it is amazing!! Quick, delish and definitely in our rotation from now on! Thank you! So glad to hear you enjoyed it Betty! Good idea to use it as a marinade too! Oh my goodness!! THANK YOU for this recipe! It is so quick and simple. I have fussy eaters that don’t like garlic so replaced it with ginger. It has gone down a treat. New favourite for us! I made this chicken today for lunch served over rice. It was amazing! It was so simple and delicious. I can’t wait to make this again. Thank you. Thank you for a great recipe. I tried this last night. My older son, who usually doesn’t eat anything with a saucy appearance, ate it and liked it. My husband, who eats anything I make, but usually doesn’t comment much about it because he eats for nutrition not taste, told me to make 10 lbs. of this next time. That means that he noticed the taste, and really liked it. I am admittedly the worst cook ever. I tried this recipe tonight. It was so easy to make, even I couldn’t mess it up. It tasted great and everyone enjoyed it! I will definitely make extra sauce the next time though. Thank you for this great recipe!!!!! Omg it came out amazing!! Thank you so much I already can’t wait to make it again. In a pinch I googled recipes for 15 minutes. Found this one and had all the ingredients at my house. It was delicious. Definitely keeping the recipe for the future when I need an easy day! Thank you! This recipe was great, I can eat this everyday! Thank you for sharing! We eat so much chicken in my household that I am constantly on the lookout for new recipes to make. I am so glad I found this one, it was quite delicious. I actually substituted Teriyaki as we had run out of Soy. It probably wasn’t the exact same taste, but delicious nonetheless! I’m so happy to hear you loved it Jen! And that’s great to know about the teriyaki substitution! This is so easy and soooooo delicious!! Thanks! Add a little sriracha and sesame oil. Trust me. Made this with turkey. I realised after I had started cooking I was out of garlic so substituted some crushed ginger and a few shallots. It was delicious and really simple to make. Quicker than waiting for a takeaway and so much healthier. 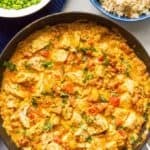 I came across this recipe whilst searching for ideas on how best to cook diced chicken, which been in the fridge for a while. I have to say I was pleasantly surprised, it was amazing. Another factor that is important for our family was the cost – it was inexpensive, using mainly ingredients we had already. That was very important to us both being on a low income. Overall, a superb dish which I will be making again!! I’m so happy to hear you enjoyed this Emily! Thanks for sharing! Kathryn …… Absolutely amazing! I did spruce it up a bit by adding Thai rice noodles (that soaked for 20 minutes while dicing, chomping, and cooking the chicken) and a bag of chopped broccoli. Also I had doubled that yummy sauce. Turning it into more of a stir fry. This was so yummy that my husband requested this for dinner tonight! I made this 2 days ago. Big, big hit. I’m so happy to hear you enjoyed it Brenda!! So I’m pregnant and have been super paranoid about undercooked food and definitely cooked this (literally) a minute too long. It still tasted good but unfortunately my skillet does not appear to have survived. I would tell people to keep a very close eye on it once you hit that 4 minute mark at the end. Mine overcooked very fast!! Sooooooooooooooooooooooo good! It makes me believe I can actually cook lol Thank you! I substituted ginger for the garlic. Awesome!! Quick easy and my son actually ate. I added the lime and seaseme. I’m so happy to hear you enjoyed it Wendy! Thanks for sharing! Made this recipe with vegetarian “chicken”. Only to 10 minutes, and tasted great. I’ve cooked it lots already because its so easy, quick, and delicious. I made this last night & it was DELICIOUS!! So happy to have come across this recipe. Will definitely be keeping this in regular rotation!! Thanks Rose! I hope you enjoyed it! Thanks Adriane! I just cross-referenced with another nutrition calculator (the one I use is automatically calculated from my ingredient list so it can be difficult for me to tell what’s included on the back-end) and yes, it appears this recipe is calculated with a serving of rice included. Just the chicken and sauce is about 235 calories per serving. I hope that helps! I added fresh cilantro at the end. It was delicious. Tossed leftovers in my salad the next day. Yay! I’m so happy to hear you enjoyed it! Love the cilantro addition! Needed something quick and easy to make my dad for his lunch for work…he loved it so much! My mom and sister tried a few pieces and loved it so much that they wanted me to make it for dinner the next night! Thanks for the great recipe! !